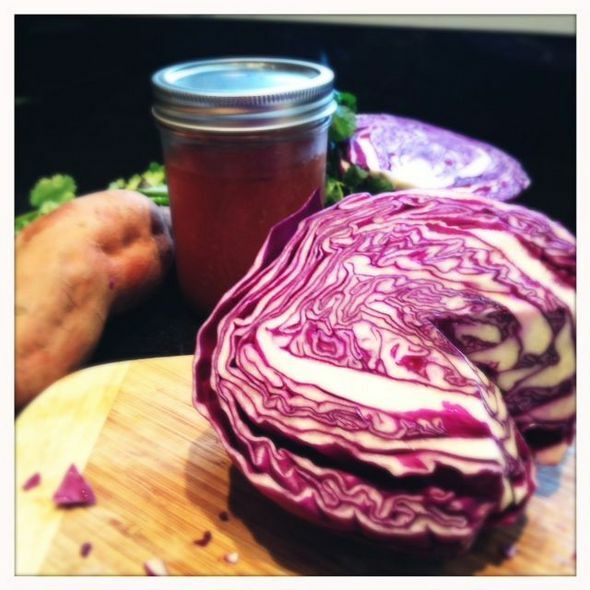 Red cabbage, sweet potato, and a jar of frozen summer tomatoes = dinner. As Slow Food President Josh Viertel points out, the soul of Slow Food is fighting for both farmers and for eaters. It means paying what it really costs for the effort to produce food that's good for people, good for farmers and good for the planet — and at the same time, making sure that food is available to everyone. "What does it mean to promote paying the real cost of food while also promoting social justice and access? Is asking people to pay more for food elitist? Is exploring affordability an affront to farmers? Can you both fight for the farmer and fight for the eater, or do farmers and eaters have competing agendas? Do we have the foresight, the bravery, and the heart to be a movement that does both?" I like to think that it is possible to do both. One way is by eating down lower on the food chain. For lots of reasons we try to eat less meat, and better meat, these days. It helps that there are now choices for meat CSAs and other sustainable options. One compliment that my husband gives me from time to time is telling friends that I'm "like the MacGyver of the kitchen." I'm not sure that 20 somethings even know from MacGyver, but he's the guy in the eponymous mid 80s TV show who was always getting himself out of a jam by making tools out of paperclips and stuff he found in his pocket lint. My thing is getting dinner on the table with whatever is in the fridge. So, while Huffington Post is publishing things like Finger food aphrodisiacs for Valentine's Day, Super fast Valentine's desserts, and 5 Cocktails for your valentine, I'm focusing on what to do with the red cabbage that I got from the Saline Farmers' Market last weekend. And how to use that last big sweet potato from our fall CSA farm share, along with the onion that's about to sprout and a jar of tomatoes I put in the freezer last fall. My MacGyver answer is one of my favorite weeknight dinners. Simple, unexpected and totally delicious. I bet your valentine will even like it. Saute onion, ginger, garlic, and red pepper in the oil 3-5 minutes, until onion is translucent. Add cabbage, and sautÃ© another few minutes. Add water and salt, cover and let cook until cabbage is softened, about 5 minutes. Add tomatoes, and sweet potato. Taste for seasoning. Let cook until sweet potato has softened, about 10 minutes. Add peanut butter and chopped cilantro. Stir into the stew until combined. Add a little cider or rice vinegar if the vegetables are very sweet and you want it to "pop" a bit. Serve with whole wheat couscous. Tue, Feb 21, 2012 : 1:02 a.m.
My husband and I had tonight...absolutely fantastic! I was wondering if you could post the nutritional info on this dish. As a vegan I'm particularly interested to know if there is much protein. Thanks for sharing. I can't wait to share this at our next potluck. Thu, Feb 16, 2012 : 1:08 a.m.
A movie Forks Over Knives talks about eating plant based foods and getting into healthier eating mode. This sounds great. Can't wait to try this. Wish the child would eat more veggies. Tue, Feb 14, 2012 : 11:09 p.m.